*NEW* Wedding Savings Revealed! - Plr! Finally! A Simple, Step-By-Step Guide To Throwing The Most Unforgettable, Wedding - And How You Can Literally Save Thousands In The Making Of YOUR Wedding! of Dollars On Your Wedding.. Guaranteed!" And how you can SAVE hundreds and thousands of dollars in creating the most stunning, and radiant wedding! It all started one afternoon when I was helping the bride plan the events that were going to take place at the reception. We had gone over every detail, from the beginning to the very end. After we had completed everything, I was to give the itinerary to the wedding planner for her to go over it and make sure we had everything in order. What she told me completely blew my mind! She said that in order for us to make the most money out of this "project", as she called it, we had to strike up deals ourselves with the DJ, caterer, the lodge where it took place, and with the photography studio. Why? So we could cut back costs with them, and put the *extra* money the bride gave us and put it in our pockets rather than saving the soon to be married couple all the money we were "supposed" to be pocketing. I could not believe what I was hearing! I asked her if she had done this before, and she told me that she's been doing that for over 15 years, and that's how she makes an extra $8,000 PER MONTH! That just struck the wrong nerve with me. I mean, weddings are already expensive enough as it is! Why in the world would anyone want to take advantage of soon to be newlyweds? As a matter of fact, I quit that very same day, told the bride all about it, and decided that I should help others save money on their weddings too..
You know, many people don't really comprehend how much money it takes to have that breath-taking wedding. There are so many things that are involved that goes into creating a beautiful wedding. In fact, many end up spending their entire budget on nearly 75 of all things that are needed to make their wedding glow before they even get to 3 months before the big day. Don't let this happen to you! And what's even more important than all of those things, is how easy it can be for you to get every single item listed above for a fraction of the cost You will learn to save more money on your wedding than you ever thought possible, I guarantee it! Quickly Discover How You Can Have An Unforgettable Wedding..
And Save Thousands of Dollars In The Making - Guaranteed! Do you know the most common mistakes nearly 95 of all couples make when budgeting for their wedding? If you make these same mistakes, it could end up costing you thousands of *extra* dollars! Do you know exactly how to save up to 67 percent on your wedding photography? Do you know how to jump-start your reception so that every single guest is up dancing, laughing, and having the best times in their lives? Do you know exactly where to begin and how to start planning for your dream wedding? If not, you soon will! You'll also learn money saving tips about how you can plan your wedding at a fraction of the cost, and learn things that you never even thought imaginable! You'll quickly discover some of the very best money saving tips, ideas, and wedding resources that will save you hundreds and thousands of dollars on your wedding. The day you get married will be a very special day for you and your significant other. There is absolutely no reason to carry the burden of the wedding costs going to your honeymoon! save money on your wedding! discover with "Wedding Savings Revealed"! This wonderful report gives you a complete, detailed list of essential wedding tasks that you need "to do" before the big day! Takes you step-by-step (checklist) from one year until you get married! This eye-opening report will truly give your reception the juice it needs to be the absolute best! It's also printable so you can check things off, and keep things organized as well.. A truly unique report only given to those who purchase "Wedding Savings Revealed"! "Weddings In the 21st Century"
Have you ever wondered who should pay for what? Traditionally speaking, there are many things that you won't have to pay for! Make sure you know exactly who pays for what so you can use the extra money for your honeymoon! 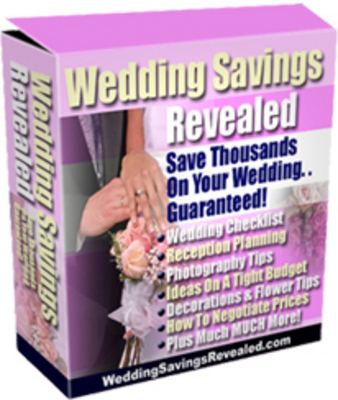 Can Grab "Wedding Savings Revealed"
& All 3 Bonuses For Half Price! That's right! I'm slashing the price. So you can grab your copy of my best-selling eBook, "Wedding Savings Revealed" for a one-time, low-low price of *only* $4.99 when you order tonight! I'll give you a prompt refund for 100 of the purchase price! In fact, I'll even let you keep all the bonuses, just for saying "thank you" for trying out my product! How about that? Get my eBook, and stop wasting your precious time searching for any money-saving tips, resources or anything else because it's ALL right here! Everything you need to save hundreds and thousands of dollars on your wedding is listed right in my eBook. Simply purchase my eBook "Wedding Savings Revealed" for a mere $4.99 and if you aren't completely thrilled and don't learn enough to save you at *least* $1,000 on your wedding, I will give you your money back. I honestly do not want your money if you aren't satisfied with your purchase. So what are you waiting for? Try it risk-free today! ... Rick And His Bride Finally Did It! I was worried about getting married. The only thing that was stopping us from doing it was the money issue. We didn't have any, period! I was searching on the internet one day and came across your website and decided to purchase it. I mean, if I didn't like it, I knew I'd get my money back anyways. So I decided, what the heck. Long-story short Mary, we finally did it! Last weekend, my beautiful fiancée and I did it! It surely wasn't the flashiest, but it was beautiful, and my bride couldn't have been any happier! ... Stephanie Says She Can't Believe It! I wanted to say thank you for all your help. And I know you like hearing from everyone you help so I wanted to tell you something. My fiancée (well, husband now) originally had a $10,000 wedding budget for everything, honeymoon included. But by using the tips, and money saving techniques in your ebook, we did the entire wedding, reception, and honeymoon for under $5,000! I can NOT believe we saved 50 percent of our budget Mary. We are going to put the extra money we saved including our gift money, plus what we've saved up already for a down payment to a home! I'll send you a picture of it when it's official :) Thank you once again!" ... Saved Over $4,000 On Our Wedding Costs! "Mary, I just wanted to write you really quick and say that your book was really a godsend! My husband and I saved over $4,000 on our total wedding costs!! Your book is truly amazing, and I don't usually say those things lightly. Thank you so much. I owe you BIG TIME!" ... Saved $1,950 On Our Honeymoon! This is Rhonda Whittington. I just wanted you to know that your ebook made my wedding absolutely incredible, and saved us a killing! The tips you gave about Honeymooning saved me and my husband over $1,950 alone! It's funny because our travel agent said 'that's all we could come up with', and we ended up printing what we saved and brought it to him! You should have seen the look on his face! He looked very embarrassed. And our Honeymoon to Hawaii was EXCELLANT! Thank you for the recommendations and ongoing support. My husband and I really appreciate it." P.S. Remember that you'll also receive three incredible bonuses: "Year Long Wedding Checklist", "Weddings in the 21st Century", and "Reception Planning & Resources (Your A-Z Guide)" with your $4.99 purchase of "Wedding Savings Revealed"! P.P.S. One more thing! Please don't forget that if you aren't 100 percent totally satisfied with your purchase, I will refund every penny, and let you keep the free bonuses! If you truly are wanting to save money on your wedding, and make it the most fabulous looking wedding in your city/town, I encourage you take and put to use our wedding planning manual! Child Safety - Is Your Child At Risk Online? Traffic Is King! - Make Things Happen With Traffic! - Mrr!